It’s been a bit quiet on the Peckish Pescy front the last few weeks. By no means have I been less peckish, but I’ve been so busy preparing to take part in the London Marathon (which I am very pleased to say that I completed yesterday in 4 hours and 20 minutes) that I’ve not had an opportunity to write about all of the tasty food I’ve been eating. I did a fair bit of reading about what to eat in the week leading up to a marathon, and across the board, oats, carbohydrates like basmati rice, pasta and sweet potatoes, oily fish and plenty of fruit and vegetables came out on top. 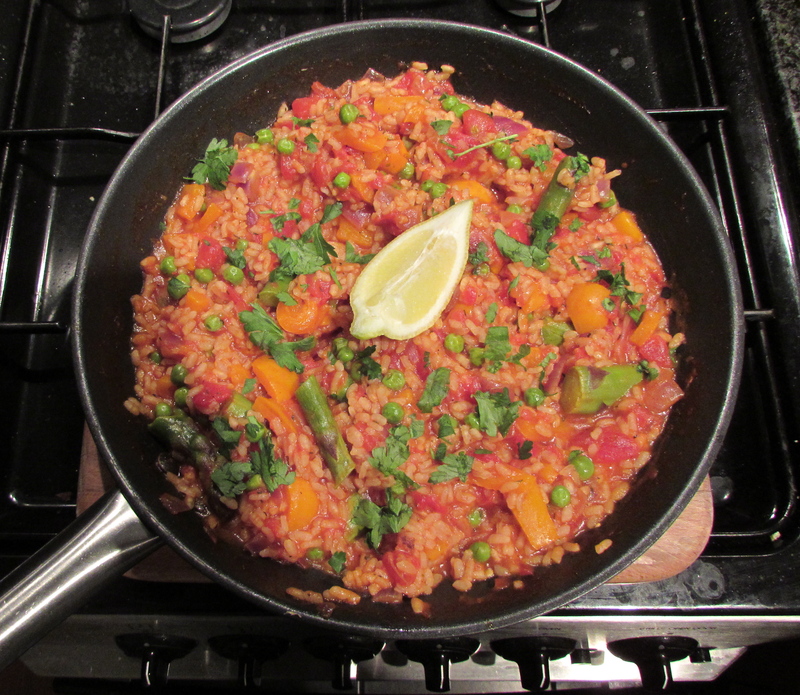 On Friday, as a penultimate pre-marathon dinner, I decided to make vegetable paella, ticking the carbs and vegetables boxes. Paella, a rice dish which originates from Valencia in Spain, is a meal I associate with holidays and festivals. My favourite memory of eating paella has got to be on a summer holiday to Spain with my best friend from university, Claire, back in 2007. We stayed in a little coastal town called La Pineda in Catalonia and stumbled across a modest and slightly bizarre cafe/restaurant down a side street, with a big TV playing MTV music videos. At the time, Claire and I were both strict vegetarians so we were delighted to see an interesting looking vegetable paella on the menu. It had all sorts of vegetables in it, including brussel sprouts, which was unusual, but absolutely delicious! I feel hungry just thinking about it! Paella traditionally contains meats like chicken, rabbit and chorizo, but there are different varieties like seafood paella and more contemporary vegetarian versions. This version of paella is vegan. I love the variety of vibrant colours from the pepper, tomatoes, asparagus and peas. This is a really wholesome dish filled with tasty and healthy ingredients. The fresh taste of the flat leaf parsley brings the dish to life and is complimented by the tarte and zesty lemon juice. You could easily add in other vegetables like carrots, butternut squash and green beans. Or if you fancy making it fishy, you could add in some seafood like prawns and squid. 1. Drizzle the oil into a large frying pan (ideally you should use a paella dish, but a frying pan does the job) and put it on a medium heat. 2. Add the onion and pepper and fry for five minutes, or until the pepper begins to soften, and then pop in the dried thyme and paprika. Stir for a minute or so and then gradually add the stock, stirring constantly, followed by the tomatoes. 3. Season well and cook for 15 minutes, adding the asparagus slices after 7-8 minutes. Stir the mixture occasionally. 4. Pour in the frozen peas and cook for a further five minutes, or until the peas have warmed through. 5. Take the pan off the heat and squeeze over half of the lemon juice. Sprinkle the parsley over the paella and stir through. Season well. 6. Serve in large bowls with the remaining quarters of the lemon and garnish with a piece of parsley. 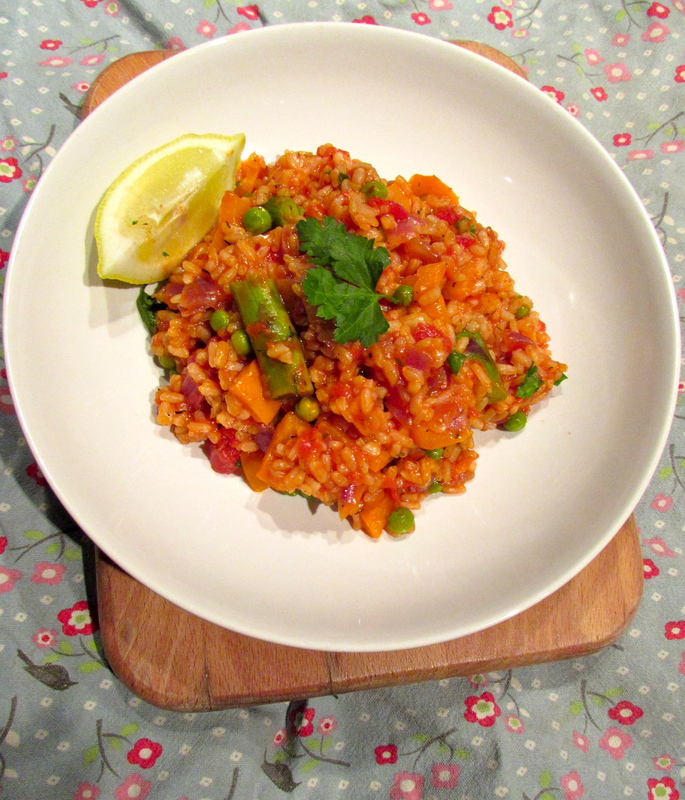 This recipe has been adapted from BBC Good Food’s easy paella recipe. I first tried halloumi cheese about ten years ago. One of my very talented friends, the wonderful Charlotte, put on a dinner party for a group of us for her birthday; a very civilised thing to do at the age of 17. As soon as I tried it, I loved it and have never looked back. Halloumi is a Cypriot cheese made from sheep and goat’s milk. Its texture is like no other cheese. It’s chewy and squeaks against your teeth as you bite into eat, which may sound a bit odd, but is so satisfying. It tastes super salty and is simply delicious. Of the many cheeses I appreciate, halloumi has got to win the award for being the fun cheese, because it’s usually served as a vegetarian option at events like summer barbecues and in American-style diners where indulgence is encouraged. I wouldn’t advise eating this cheese raw, it’s very much a food that should be cooked, either by frying, grilling, barbecuing or baking it. It’s really versatile and can be used in a wide range of dishes, especially fresh, warm salads. 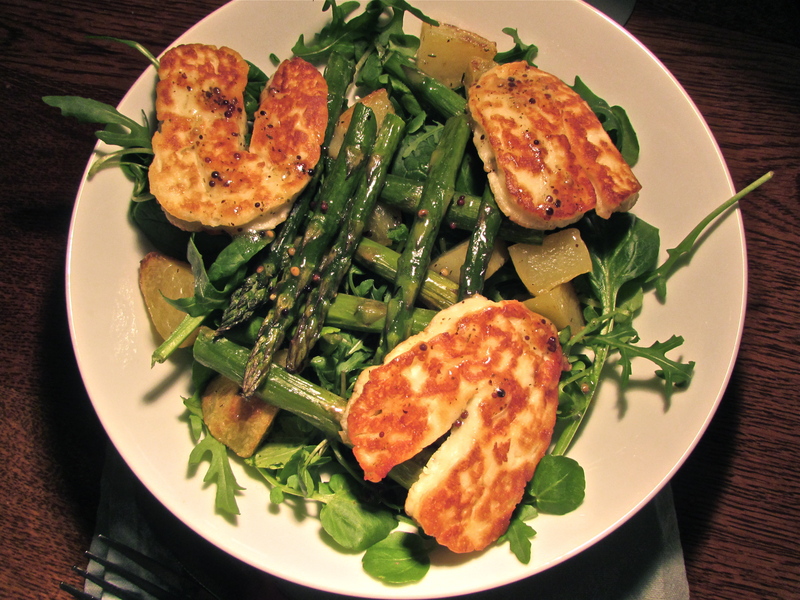 I put this halloumi, asparagus and potato salad together with ingredients I had in the fridge. I hadn’t initially intended to include potatoes, but I had some spuds that really needed using up (at the point where they were sprouting) and thought they would add an earthy and filling base to the meal. The mixed salad leaves add a lovely crisp crunch and the silky smooth baked asparagus spears compliment the salty halloumi delightfully. The honey and mustard salad dressing adds some moisture to the dish and contrasts well with the salty cheese. This is a really fresh dish that can be served as a light dinner or a hearty lunchtime treat. 1. Half-fill a medium saucepan with cold water, add a sprinkle of salt and bring it to the boil. 2. Meanwhile, peel the potatoes, give them a rinse and then chop them up – to about half the size of a standard roast potato. When the water is boiling, carefully lower the potato slices into the pan and boil gently for 5-10 minutes, until they begin to soften, but don’t let them cook to the point of becoming fluffy. 3. As the potatoes are cooking, put the oven on to gas mark 6. Pour the sunflower oil into a large baking try and sprinkle over the dried thyme. Place in the oven to heat up. 4. Drain the potatoes in a colander and shake off any excess water. Take the baking tray out of the oven and tip the potatoes into the tray, distributing them evenly. Use a wooden spoon to cover the potatoes in the thyme and oil, then season well and put in the oven for 30 minutes, turning them over with the wooden spoon half way through so they crisp up on all sides. 5. While the potatoes are cooking, chop the woody ends off the asparagus spears and then chop each of the spears in half. After 30 minutes, take the baking tray out of the oven and make some room for the asparagus spears, so they are only one layer deep. Coat them in the oil from the pan and pop the tray back in the oven for 15 minutes. 6. Next, chop the halloumi block lengthways into six chunky slices. 7. Put a large frying pan on a medium heat and drizzle in the ½ tbsp olive oil. Add each of the halloumi slices to the pan and fry for 10 minutes or so, turning every few minutes so they turn a golden brown on both sides. 8. While the halloumi is cooking, mix together all of the salad dressing ingredients in a jug. 9. Check on the potatoes and asparagus. When the potatoes have crisped up and the asparagus has softened, they’re ready to serve. 10. Lay the salad leaves in the bottom of large pasta bowls or plates and scatter over the potato slices. Place the bottom slices of the asparagus on top, and then lay the tips over the top of them in the other direction, so they make a sort of asparagus noughts and crosses shape. Place the halloumi slices on top and drizzle over the salad dressing.